The recently certified models are likely to be the Lite version of the BlackBerry Key2. TCL launched the BlackBerry Key2 smartphone at New York in early June. A week ago, popular tipster Evan Blass claimed on his twitter handle that there would be a Lite version of the Key2 smartphone codenamed ‘Luna’. It will have the same design factor and will be available in Red, Blue and Copper colour variants. Now, two smartphones with model numbers BBE 100-1 and BBE 100-2 has passed FCC (Federal Communications Commission) dated July 25 and July 23 respectively. 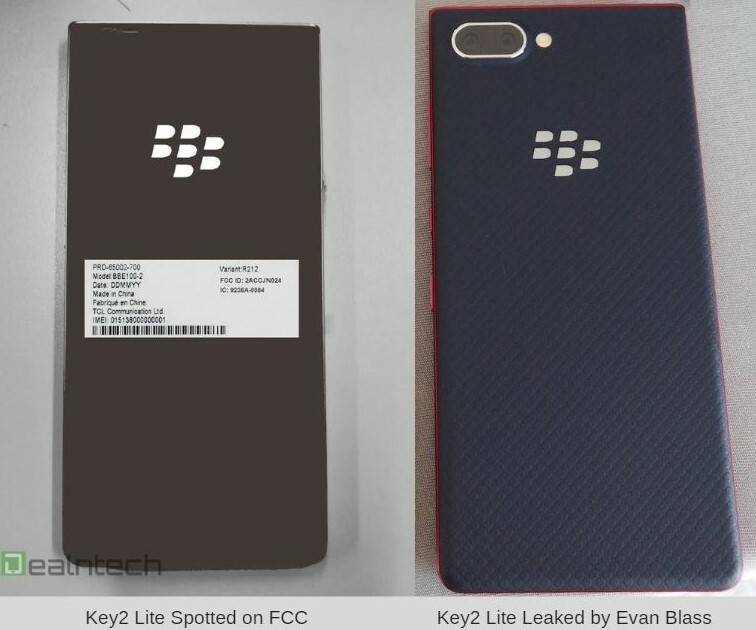 They are most likely the Lite variant of the BlackBerry Key2, the ‘E’ in the model number standing for Lite. Connectivity features are revealed as Wi-Fi 802.11 a/b/g/n ac (2.4GHz + 5GHz), Bluetooth and NFC and will be backed by a 2,900 mAh battery. The BBE 100-2 has also previously appeared in benchmarking site GeekBench. It is listed to be powered by a Quad-core Qualcomm Snapdragon chipset clocked at 1.84GHz coupled with 6GB RAM and runs on Android 8.1 Oreo. It managed a score of 1,291 and 4,838 in single core and multi-core tests respectively. As for the BBE 100-1, the specs shouldn’t be far off from that. The FCC attached images shows the same body design as the Key2. However, the cut-out from the rear cameras is missing along with volume rocker and power button. The images are likely of a prototype version indicated by uneven edges and scratches. The company will be including all the details in the market ready product. It was reported that the BBE 100-1 and BBE 100-2 models of the Blackberry Key2 variant would be launched with single SIM and multiple band support. The models made appearance in the Eurasian Economic Union (EaeUnion) database earlier this year hinting that this variant will be for the European countries. As for now, there is no confirmation of the launch date from the company but may be announced in the IFA 2018 event to be held in Berlin from August 31.